“When it’s been raining cats and dogs, where else to go but Lurchers Crag,” Andy Nisbet suggests. “In fact the idea was born when Matt Griffin sent me a photo of the K9 area in order to ask if a line he and Adrian Dye had done by accident was in fact new. And it was, a line up the ribbed area left of the depression of K9 and now called Far from the Madding Crowd, was III,4. While happy to help him, I was more interested in various icefalls around where I thought K9 went, wrongly as it later turned out. Jonathan Preston and I went in on a horrible New Year’s Day, with the wind and spindrift howling down the Lairig Ghru. It was another day where both of us wanted to turn back at various points, but never simultaneously, and the weaker one always conceded. In fact the wind was east of south, and when we reached the base of an ice column left of the main K9 fault, it was relatively sheltered and both of us were happy to be there. I hadn’t climbed ice this season and my picks were blunt, so I was happy when Jonathan volunteered to lead. I found the vertical ice very strenuous but found the icy ramp above much more enjoyable, although the booming, obviously detached, crusty ice was clearly better when seconding. But I had recovered enough to lead a bigger but less steep icefall leading out left from the upper depression. The route was IV,5. A thaw delayed a return and Jonathan was working, but a forecast of freezing brought Susan Jensen into the fray on January 4; the icicle through the roof above K9 was the obvious temptation. Of course forecasts aren’t always right, and it did seem very warm when we left the car. The lightest of crusts on the snow tempted us on but even when we arrived below the route, the crust was still on the thin side. Susan was keen to lead the steep bit so I teetered up the mushy snow fortunately to a good belay below a steepening groove. This gave Susan a precarious lead with fortunately a more solid exit. Her suggestion that a fall would only have led to a slide down the snow, wouldn’t have given me much comfort if I’d been up there. But the ice improved a lot above the groove and good ice screw runners led up to a short column through the left end of the roof system. From there we finished straight up the main depression on lower angled ice with the occasional bulge to reach the now icy hillside above. V,5 seemed the right grade. This entry was posted in New Routes and tagged Adrian Dye, Andy Nisbet, Jonathan Preston, Lurcher's Crag, Matt Griffin, Susan Jensen. Bookmark the permalink. We did a version of K9 on Saturday 11th January, starting up the right facing corner beneath the ice on the left side of the huge roof. First pitch was on cruddy ice and mixed ground. From the belay , still in the corner, didn’t fancy a direct approach to the ice leading through the big roof (which is where Susan Jensen appears to be), so traversed up a right slanting snow ramp then back left up some steep ice and a turfy groove to a belay 5 metres below the recess/cave in the middle of the roof (where there was some newish tat, also a chandelier of icicles ominously dripping above.). The route then went diagonally up and left on weird ice, all bubbly due to continuous thaw and freeze from the icicle drip, and straight up a short steep section at the left end of the roof. The natural finish in terms of line would be straight up from here up icy grooves, but we headed up and leftwards as per guidebook over easy ground to do the upper icefall described as being in a corner, but more of an open groove. 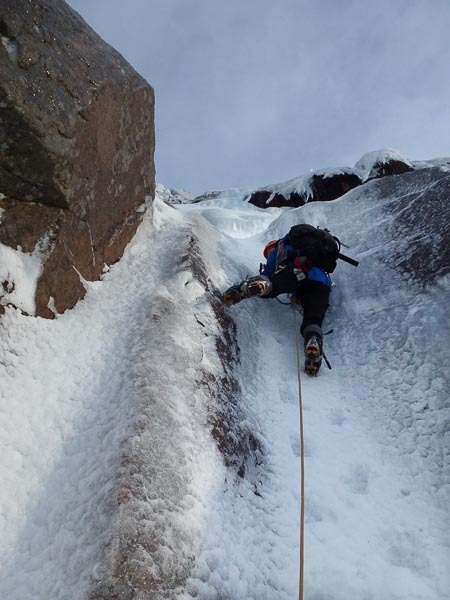 The ice was very hard and brittle so ascent was accompanied by a shower of bits and pieces and the odd block! Quite a full-on outing, and we felt IV/5 possibly even V/5 in those conditions. Oh and I fell off leading the second pitch when a turf placement ripped but was saved by my (Grivel) lanyard attached to the other tool that stayed put! John, You’ve climbed the best ice available on the day, which is what the original ascent did (except no ice on the overhang as it was March). With more ice around, I managed to get two routes out of it. Seeing your picture I doubt the alternative starting ice some 30m to the left was there.